If you made it to our website, then you must be in the market for some kitchen or bathroom cabinets. That’s what we do here, we sell All Wood cabinets in ten days or less. Our commitment to you is to deliver a quality product in a timely manner. R&R Kitchen and Bath has been proudly serving Melbourne, FL and the entire Brevard County and Spacecoast since 2000. We do complete kitchen and bath remodeling throughout the area and offer beautiful, all wood kitchen and bath cabinets. We specialize only in creating stunning, all-wood cabinets for kitchens and bathrooms as well as offering complete high-end remodeling of both kitchens and bathroomss. We are here to fulfill all of your kitchen and bathroom remodeling needs. But we also pride ourselves in delivering that high-end look at a low-end price that we're sure you are going to love and probably be very surprised with. With every one of all wood cabinets, we are proud to deliver a beautiful, high-quality product to you in ten days or less. We can do this because we have one of the largest selections of materials in the Brevard County area, already in stock to choose from. All of our cabinets are made out of only the highest quality real hardwoods, such as Oak, Birch, Maple, Walnut or finished plywood and never from, inexpensive woods like particle board or engineered wood. Our all wood, cabinets are completed by master craftsmen with many years of experience. Each cabinet they produce, we like to consider it a work of art. We offer an affordable all wood cabinets. You pick out the style you want, and we do the rest. Come visit our showroom or have us come to you. We always give you a free estimate. We can deliver a kitchen to you in 10 days or less, and have one of the largest selections in Brevard County. Our cabinets are all of wood construction, no particle board or engineered wood. We offer a quality product at an affordable price. Why Would you go anywhere else? 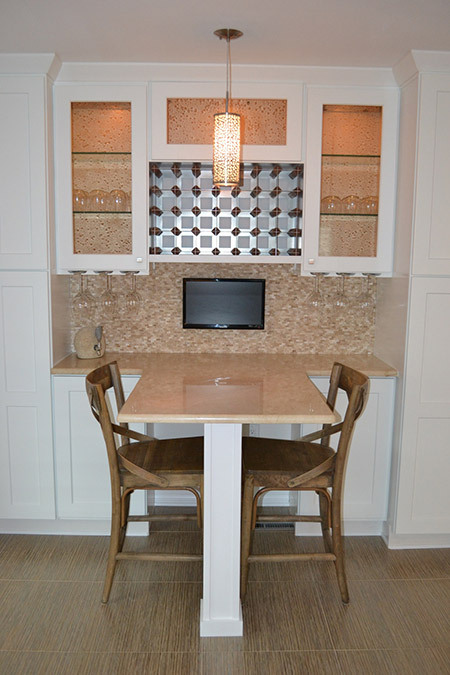 Custom jobs, kitchens, bathrooms, offices, bookcases, entertainment centers and more. Your home is a very valuable asset, so why not let a reliable, well-established company give you the personal attention you deserve? We will deliver a quality job in a timely manner, and make sure that you are completely satisfied. Remember, we are only as good as our last job! Our cabinet design process starts with the most important element of all and that is you, the client. 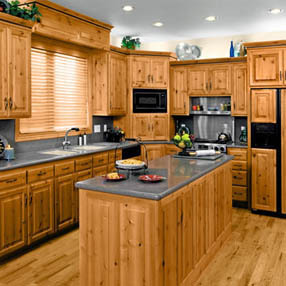 You select the style of cabinet you want from our large selection of quality all wood cabinets. Remember, our cabinets are all wood, doors and face frames are solid wood, and the box is made from cabinet grade plywood. We never use particle board or engineered wood. After your cabinets have passed inspection and are ready for install, we will professionally install them for you, or deliver them and let you install them yourself. If we install your cabinets for you, you can rest assured that they will be done professionally and in a timely manner. In fact, we are so committed to quality craftsmanship, workmanship and service that our work has been the recipient of the Florida Business Today Spotlight. So call or email us today to set up an appointment to discuss your Kitchen or Bathroom remodel plans! We gladly offer free estimates on all jobs. Whether you need help with All Wood Kitchen & Bathroom Cabinets or Granite and Formica Countertops, we are the best option in Brevard County and the Spacecoast. R&R Kitchen and Bath is a proud recipient of Florida Today Business Spotlight. We are also active members of professional societies. Let us work for you and see for yourself how we exceed our customers’ expectations. We always offer a free estimate!